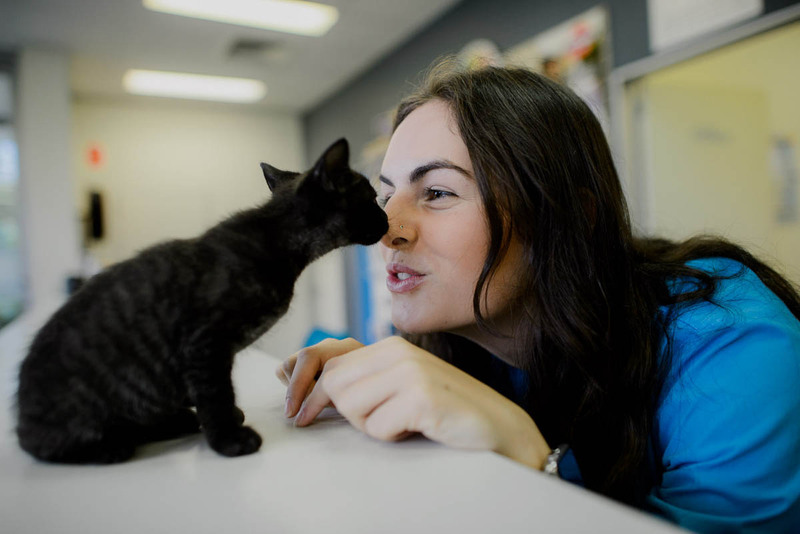 Our friendly staff are happy to answer any of your questions and give you the best advice on raising your kitten, including vaccinations, microchipping, de-sexing, worming, flea and tick prevention, feeding and behaviour training. Please contact us on phone or by email. Kittens need to be vaccinated starting at 6 to 8 weeks of age, and they require booster shots until they are about 16 weeks of age. Cats are routinely vaccinated against Feline Enteritis and Cat Flu, but there are a few common issues that kittens can have, including worms. Worming tablets can be given from around 4 weeks and then monthly after that. Kittens shouldn’t be allowed outside unattended until at least 6 months of age. So it’s important to make inside fun for the kitten, with plenty of cat toys and scratching posts etc. Vaccinating your kitten will protect them against nasty infectious diseases such as feline calicivirus, feline herpes, feline panleucopaenia virus & feline aids. These diseases live in our environment and can easily infect your kitten making them very sick. Please call us on 66523455 if you would like any advice on vaccinating your kitten. When is my kitten due for vaccination? Vaccination programs for kittens start when they are approximately 8 weeks of age. Vaccinations require a series of boosters up until 12-16 weeks of age, after this period they will then require annual boosters. Why do I need to microchip my kitten? Microchips are the most effective way of re-uniting lost animals with their owners. A microchip is a small chip which is inserted under the skin of your cat which is linked to a database that stores your contact details. In NSW it is a legal requirement that all cats are microchipped. Please ensure that you keep your contact details current with your local council and companion animal registry so that in the event of your kitten going missing and being found you can be easily contacted and reunited. Why do I need to worm my kitten? Worms are very commonly found in kittens and they can cause many health issues such as weight loss, poor development, anaemia, dull coat, lethargy, diarrohea, vomiting and general unwellness. Contact our friendly staff and we will help tailor a worming program to best suit your needs. When do I worm my new kitten and what is the best product to use? Kittens should be wormed with a complete intestinal wormer such as from 6 weeks of age. There are numerous different intestinal worming products available and directions for use on their packaging should be followed. We can help tailor a worming program to meet your requirements, please call one of our friendly team on 66523455. Why are fleas harmful to my kitten? Flea bites can cause anaemia, skin irritations and allergies making your kitten unwell, distressed and uncomfortable. Fleas breed rapidly and can quickly infest your environment and other animals in your household. Why is it important to use tick prevention and perform daily tick searches on your kitten? Ticks are commonly found in our environment and have even been known to attach themselves to pets who only live inside. Ticks can be as tiny a pin head and often very hard to see through the fur on your kitten. When a paralysis tick attaches itself to your kitten it releases a toxin which enters the nervous system and has potentially fatal consequences for your kitten. Signs that your kitten has been bitten by a tick include:- change in voice, change in breathing (may become shallow, deep or laboured), coughing, vomiting, change in gait including wobbliness or staggering, unable to use back legs and unable to stand up. If you suspect that your kitten has been bitten by a tick then you need to keep your kitten calm, cool, quiet, restrict any food or water intake and contact your veterinarian immediately as deterioration happens fast. Tick prevention products and daily tick searches are effective because they help to reduce the amount of time a tick is attached to your kitten hence limiting the amount of toxin a tick releases into your kittens system. Our friendly staff are happy to teach you how to effectively tick search your kitten as well as help tailor a tick prevention program that best suits your needs, please call us on 66523455. When can I use flea and tick prevention products on my kitten? Products such as Frontline Spray can be used safely on kittens from 2 days of age. No tick prevention product is 100% guaranteed against protecting your kitten from tick paralysis, we always recommend daily tick searches and that cat owners are aware of the signs of tick paralysis and consult their veterinarian immediately if they suspect tick paralysis. Please read product packaging for doses and directions or contact us on 6652-3455 so that we can help tailor a flea and tick prevention to suit your needs. When do I have my kitten desexed? The best time to have your kitten de-sexed (also known as Spey for females or Castrate / neuter for males) is around 5-6 months of age. De-sexing your kitten is a day procedure done under general anaesthetic. For more information please call us on 6652-3455. What is the best food to feed my kitten? Because your kitten is growing and developing it is important to always feed a “Kitten Food” until they have had their 1st birthday. We recommend Hills Pet Nutrition brand as it is a premium cat food which has completely balanced proteins, vitamins & minerals. Your kitten will maintain a healthy weight, shiny coat, strong immune system and have plenty of energy to play. Hills Pet food is highly digestible which means no tummy upsets and less smelly waste for you to clean up.